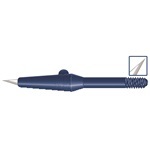 Disposable, single-use metal blades, ophthalmic angled implant knives with blue handles. Blades are available in various widths and are bevel up with 45-degree angled tips. Disposable, single-use metal blades, ophthalmic angled slit knives with red handles. 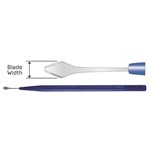 Comes with bevel up or double bevel options with a 45 degree angled tip. 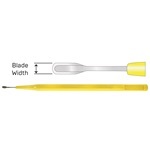 Disposable, single-use metal blades, ophthalmic crescent knives with yellow handles. Crescent blades are rounded have a bevel up or down and straight or angled. Packaged individually, sterile. Sold 6 per box. 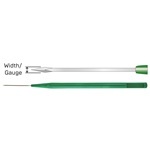 Disposable, single-use metal blades, ophthalmic Sideport/MVR knives with green handles. Blades are available in various sizes and gauges with angled or straight shafts. 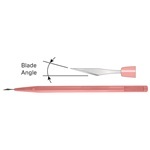 Disposable, single-use metal blades, ophthalmic straight knives with pink handles. Blades are available in various degrees but all blades are double bevel. Beaver-Visitec and Sharpoint brand disposable stab knife tips that screw into handles, handles not included. Blue in color with 15-degree angled tips.